“The attempt — with the origin and nature of humankind in mind — to take a gigantic leap back into the world of the lost beginning, to seek to know for ourselves what humankind was like in its original sate and to identify our own ideal of humanity with what God actually created is hopeless. It fails to recognize that it is only from Christ that we can know about the original nature of humankind. The attempt to do that without recognizing this, as hopeless as it is understandable, has again and again delivered up the church to arbitrary speculation at this dangerous point. Only in the middle, as those who live from Christ, do we know about the beginning” (Creation and Fall, 62). Even though it is creation and the fall (as well as the promise that follows) that are at the centre of the opening chapters of Genesis, and very little time is spent on the in-between, I think Bonhoeffer overstates his point a bit. This is perhaps understandable when one considers the naively optimistic or self-aggrandizing natural theologies of his day which he is reacting to. What we do know quite clearly from the opening chapters of Genesis is that humans were created to reflect, on their own level, the creative act of divine self-giving. God creates and then gives to his beloved creatures everything that he has made as a token of his love, so that the humans, too, though they cannot create anything out of nothing, would use the gift of God’s love to express their mutual love for each other. To put it in very modern terms, God endows us with an enduring identity (a blessing), so that, freed from self-concern (or self-making! ), we might live lives lovingly on another’s behalf. The restoration of this structure of being is, of course, one of the dimensions of Christ’s work (even Christ’s person, when one considers the communicatio idiomatum). I agree with Bonhoeffer that, in order to truly understand the nature of the in-between, we must look to Christ. But the point is that God’s deed in Christ is not out of character or incompatible with the Genesis account. So it’s not a question of choosing between Genesis and the New Testament. What we really mustn’t look at is our perceived problems. Interestingly, even Luther tried at times to speculate about the image of God on the basis of a present lack in us. This strategy is extremely dangerous because we, as sinners, have a very twisted concept of what we lack. Responsible talk about the image of God must begin, well, with God, and by that we mean not God as an idea but God as Creator and Redeemer. I have always found it useful to view creation from the stand point of what God is ultimately restoring us back to. The structure of these restored relationships between God and man, and man and man, as we see them in Genesis, reflect the goal of, and motivation behind God’s saving work in Christ. In this way, Christ not only impacts our understanding of creation, but creation impacts our understanding of Christ. When will “Lutheran” theology find Luther again? And what is the central point of Luther’s theology? Myself, I turn back again and again to Walther von Loewenich’s book” Luther’s Theology of the Cross. Also the Roman Catholic and French scholar Fr..Daniel Olivier’s book: Luther’s Faith, The Cause of the Gospel in the Church is very good! Now, when it comes to Lutheranisms (understood as discrete denominations), I’m not sure that they are all that interested in finding Luther, the 16th c. reformer. They have all, in the course of their history, developed sets of additional concerns, perhaps even their own idols. But even if they were interested in finding the “historical” Luther, I’m not sure what this kind of romanticism would mean today. Perhaps the question should be, What is the usable Luther? (Note that by ‘usable’ I don’t necessarily mean relevant, where relevance is defined in some external fashion outside of the realities of sin and grace.) What is the Luther *we* can learn from, with, and sometimes even against? How can we take Luther seriously, and yet critically? Thank you for your comment, Joel. I couldn’t agree more. Piotr, I agree on the “usable Luther,” and to refer to Adam’s post on Bonhoeffer, I think what the Church needs is the “usefulness” of Luther (something this site is definitely hoping to contribute to). 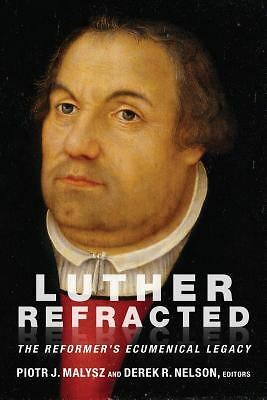 The “usable” Luther is a bit of a chore (an enjoyable one at that) because, in my opinion, his contextualism is something that always needs to be wrestled with (something that is addressed, but possibly contrarily, in your Bayer/Gleede review). Luther, much like the bible, is someone who transcends proof texting. Amen gents, on the “usable Luther”! We still need this Reformer in the context of both his Catholic Christology and his idea of simple faith formation toward the central Pauline doctrine of the crucified Christ. For Luther the sinner does what is in him when he cries out for a virtue which he does not have and which he is all too painfully aware that he lacks. And this is constant for the sinner. “God be merciful to me a sinner” We will always need this!